Taylor Swift, an American music superstar has made a sizeable donation to the Tennessee Equality Project — an Organisation which works against a series of bills which are said to target LGBTQ people. 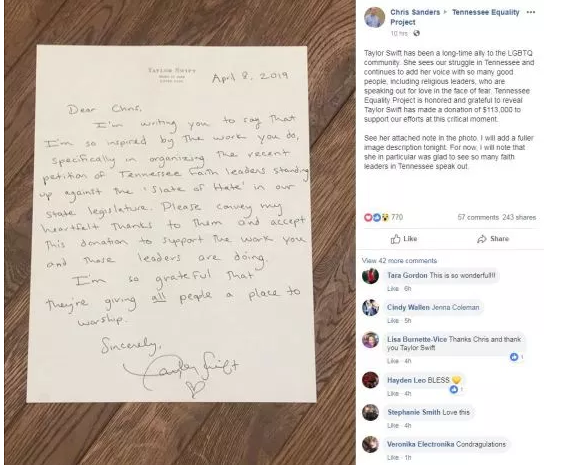 Tylor Swift wrote a letter to Charity’s executive director Chris Sanders, in which she stated that she was inspired by the work the organisation does and she has been touched as local faith leaders are now standing together against the state legislature. It is to be noted that Taylor Swift has made a donation of $113,000 (£87,000) to the Tennessee Equality Project and said she is so grateful that they are giving all people a place to worship. Apart from the huge donation, The Blank Space singer had gifted a handwritten letter to the organisation. Taking to social media, Chris shared her letter. It is to be noted that Taylor’s donation comes six months after she broke her decade-long political silence to plead with fans to make sure they are registered to vote in the upcoming US mid-term elections. In October 2019, Taylor cited the importance of LGBT rights as one of her reasons for endorsing Democratic candidate Phil Breseden for Senate. Since the news of Taylor Swift’s donation broke, many celebrities including Ellen DeGeneres and Katy Perry — shared their appreciation for her support of the community. What an ally the community has!